I am returning Abstract painting from near extinction to contemporary consciousness. Rufus Knight-Webb lives and works in South London and represents the true avant-garde of abstract painting with his highly evolved, dramatic, gestural and rhythmic paintings that are the product of two decades of sustained invention, culminating in a new form that could be called Techno Expressionism. He has worked with leading figures in contemporary art, including Michael Craig-Martin and Alan Davie, who continue to have a profound influence on his development as a painter. By the late 1980’s Knight-Webb had lost faith in Modernism, and was seeking a new impetus for painting. The dawn of the Acid House scene and the advent of electronic music presented new possibilities to Knight-Webb, inspiring him to originate a totally contemporary form of Techno Expressionism. 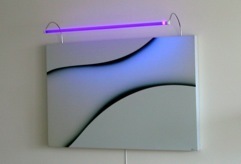 Knight-Webb began a series of works in fluorescent acrylic that revealed a further dimension under UV light. What appears as one painting during the day, metamorphoses into a new work at night. These new Space Paintings were a hybrid of abstract forms, geometric patterns and psychedelic illustrations of cinematic space epics such as Stanley Kubrick’s “2001”. Hi work appears on many iconic record sleeves of the 90’s, such as Derrick May’s “Innovator”. Around 1997, Knight-Webb started a series of highly futuristic Paintings. These UV illuminated paintings demonstrate the seduction of abstracted form; with minimal illustrative content, they aim at aesthetic economy. The ‘Earthy’ feminine shapes hint at the surface and folds of the human body. 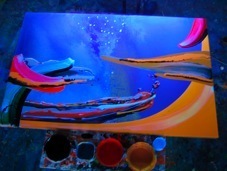 Knight-Webb has created and patented a unique UV lighting system to illuminate these paintings. 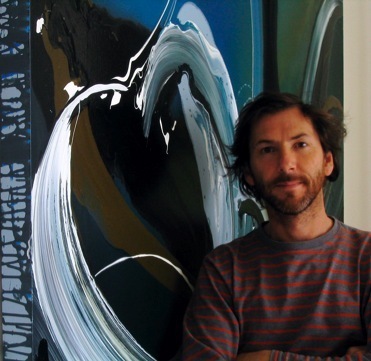 Knight-Webb works intensively on two contrasting series of paintings, The ‘Action Paintings’ and ‘Light Paintings’, and has continued to expand on the essential duality between the assertive emotional push of abstract expressionism, and the cool technical aestheticism of the more illustrative ‘Light Paintings’. In these abstract works, the artist returns again and again to his original muse: electronic music. Back in his studio, and working to a soundtrack of minimal music by American composer Saul Stokes, he is preparing the groundwork for a one hit action painting, in an on-going quest to capture the euphoric moment of spontaneity and conception in painting. 1999 NGCA, Sunderland VANE: "Node 5 + 5"
title: "Every 15 minutes": Collaboration with Ally Wallace. an installation using the gallery's existing tannoy and lighting. Other artists: Tomoko Takahashi + Gordon Doulton . William Heard etc. 1999 60, Long Lane, London SE1 "Location, Location, Location"
1999 Walton Contemporary Art, London. "Third Person Singular"
Ultra-violet illuminated paintings, following the movement of human body. title: "Silent Revolution": Collaboration with detroit musician Derrick May.